I don't know anyone my age with even a mild interest in automotive racing who isn't a fan of 60s-era endurance races. The Ford vs. Ferrari saga is well-documented and legendary: Henry Ford wanted to win Le Mans, and after a failed attempt to acquire Scuderia Ferrari, directed his people to come up with a Ferrari beater. The resulting Ford GT40 won Le Mans each year from 1966 thru 1969. 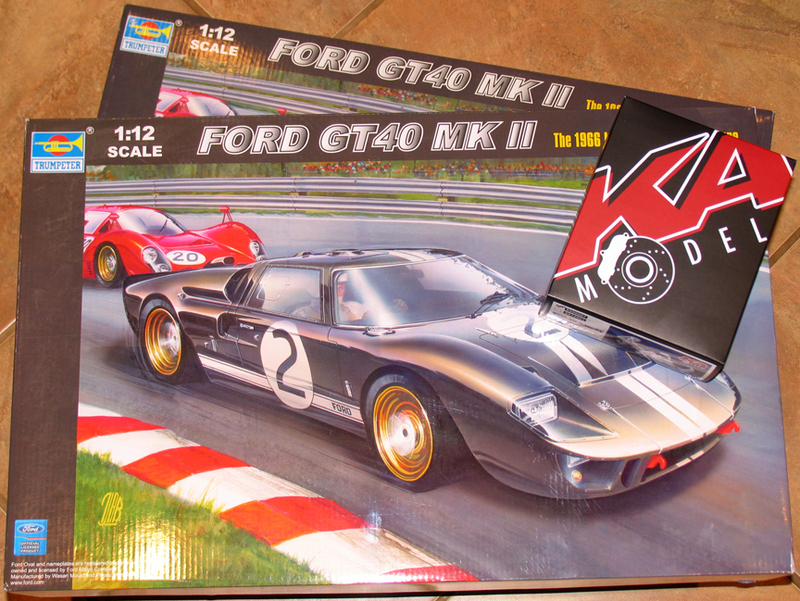 In the modeling world, there haven't been too many kits available of this history-making Ford. 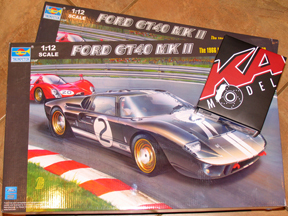 But in 2008 when word began circulating that Trumpeter would be releasing a GT40 in big 1/12th scale, many, many enthusiasts started pining away for the Big Day. That day finally arrived in late 2009, and I picked up two copies with the intent of building one out-of-the-box, while the other would incorporate a super-detail set which would be sure to follow. The Trumpeter kit models a Mk-II variant, which was powered by a Ford 427 (7.0L) V8 - actually I have seen reference material which claims the early motors were actually sourced by Mercury, but they would have been identical to the Ford versions. In 1966, the MkII represented the first competitive GT40 and was a large refinement over the original Prototype and MkI cars. MkIIs brought home sweeping wins at Daytona and Sebring. In June of that same year, Henry Ford II finally realized his dream: GT40 MkIIs finished 1-2-3 at Le Mans. Of course, anytime you find yourself thinking of 60s-era Le Mans races, if your mind doesn't wander off to Steve McQueen in the '71 classic Le Mans, you cannot consider yourself a true afficionado. I had the great fortune to see this film at the theater several times, and was always drawn to McQueen's gorgeous Porsche 917 in GULF Racing livery. Given that GULF also ran several GT40s - although, to my knowledge none were MkIIs - I have already decided that the first car I build can only be finished as a GULF car (and to heck with the rivet counters who cry "foul! ").